Is the Apple Slate the saviour of magazines? What's the point of digitising a bunch of disadvantages? suggesting an ideal delivery system for their e-magazine formats. They show how a magazine-like product might work on a touch screen tablet-style device with fingers turning virtual pages, skipping through photo galleries and tapping to zoom in on areas of interest - familiar actions to anyone with an iPhone or iPod touch. And there's no doubt it looks good from the narrow perspective of replicating some aspects of the magazine experience - certainly more so than Google's pretense that JPEGs of newspaper pages amount to anything. But is it really a pointer to the future? Magazine publishers set great store by the 'magazine experience' - the physical engagement readers have with a magazine: portability, photography, immersive reading, the feel of the magazine on the fingers, and so forth. 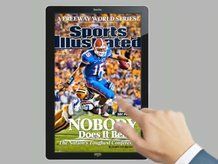 It's this experience - of turning pages and entering layouts, that Sports Illustrated hopes to emulate, and sets it apart from previous experiments in e-publishing. And it is true that so far, the web hasn't been much good at delivering any of that physicality and engagement. Yet magazine sales have still fallen while web access to the same material has rocketed. So if a magazine's physical package is such a great thing, why hasn't it held up better against the onslaught of the web? The reason is the physical nature of magazines is a limitation, not a benefit. The mag package is useful mainly to distinguish one magazine brand from another. Take two mags and most people will go for the one with the better writing, pictures, paper stock and finish. But take one mag and one website, and most people will go for the website. And that's because the web is better at all the other things that magazines used to exist to deliver - community, currency, niche interest and usefulness. As the music industry has discovered with the album, people no longer want to pay for tracks that hold no interest for them. Magazines have the same problem: they are aimed at groups of people rather than individuals, and therefore contain stuff individual readers don't want. Every magazine is a compromise, but one you have to pay for. So recreating that kind of bundle, as Sports Illustrated is attempting to do, probably isn't going to work. Then there is the problem of the link. Too much linking out and you negate the point of having a coherent package in the first place. After all, that focused attention is what publishers ideally want to sell to advertisers. Too little linking and people don't trust you. As for inlinks, there would be none. Given the central importance of the link to digital editorial, anything that devalues its importance, sidelines it or makes it into a problem, suggests a pretty basic flaw. Another problem is that magazines are, and will remain slow compared to the web, severely diminishing their currency. The timescale that matters these days is measured by the minute. Packaging magazines a time-consuming business. Sports Illustrated's digital mag looks fantastic but it is shot through with time overheads caused by the packaging, from the lovely contents spread, to the embedded video, to the way one item of content follows another in planned succession. Even if the product is constantly updated, say via a 3G or WiFi connection, I can't see how you can have a product that aspires to a high level of packaging craft yet is fast enough to complete with websites. If you go with templates, then you lose the point of the craft, and you are back to doing what websites do. Perhaps there are benefits that outweigh all this. Maybe as with the iPod or Kindle, the ability to carry whole libraries around is enough to make it succeed. But unlike books or music, magazines are disposable and date quickly, and are rarely returned to once completed. However you stack it up, trying to replicate the pure magazine experience in digital form seems like a waste of time. And yet... there is still something compelling about the Sports Illustrated experiment. Perhaps it is the impact of the photography, something the web still does badly, and the close integration between text, pictures and video and multi touch displays. Perhaps it is the ability to get drawn into something as opposed to the distractions of the web. Perhaps it is the overall quality of the product. .
Somewhere in this, there is the potential for something interesting. But surely the proper starting point isn't replicating the magazine, but improving the website. Marry the strengths of online, the visual impact of magazines and the touch and feel of multi touch... well, that would be interesting.